How to Change the Address of Your Voter ID card: Voter card is very important for choosing any government in India. And voter Card is the permanent ID proof of you to be identified as the citizen of India. In India, the election of any government is very important in each and every state or central levels. As India is a democratic country, all the system and procedures in India is run by the government of India. The governments were chosen by the people and it is benefited for the people too. As selecting any Government is of essential, and the voter card is the main answer for such elections in India; so one must have their Voter ID card with its exact detail and information of any individual person. It has been mentioned that many citizens have their voter id with lots of errors and Spelling mistake in the card regarding the address, name and other information of the person and this always create severe problem to any person. So you must make changes in the given Voter Id of yours before it cripples you. Below we are going to discuss the procedure about How to Change the Address of Your Voter ID card within the Same Electoral District which will be the procedure for making through online. There is a very simple step to change the address or any other error acquiring in your voter card and all the process can be done through online. The Election Commission of India has the Chief Election Commission for every state's website; where one can easily perform the changing of address or any other error in their voter ID card. Under the site of CEO of any state, you have to log in and register yourself first to get access to the form no.8. once you have found the Form no.8, next you have to do is fill up the form carefully and make sure the spellings of each sentence is perfectly entered. Once you have successfully entered all the required details with exact spellings and other content. You have hit the submit button to proceed. And after doing so, now it turns for downloading the form no.8. Now take the downloaded Form no.8 along with you and the Form no.8 must be submitted to the office of Election Commission of India of your state. After you have submitted the Form no.8; an officer will personally visit the provided address you entered and then will confirm the detail that you have provided in the Form no.8. After the duration of 2-3 month form the day that the officer visited your address; you will receive the new voter ID with improved and corrected form of voter ID Card. The creation of new Voter ID card will take a short period to be developed and then once developed you will receive them via post to your provided address. 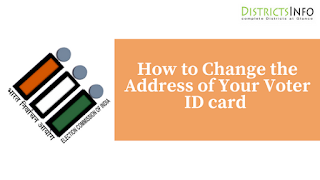 So these are the best process for changing the address of your voter id card whenever you sense some mistakes or error into your voter id card. And after your voter ID is successfully developed your new and corrected voter id card will be delivered to your provided address by post.